Have you just arrived home from a long work day and want to prepare something simple? You look in the refrigerator and the only thing that looks easy is the not-so-tasty frozen dinners? So instead you hop in the car and its off to the fast food restaurant. Wouldnt it be nice to be able to prepare something that was tasty yet simple? 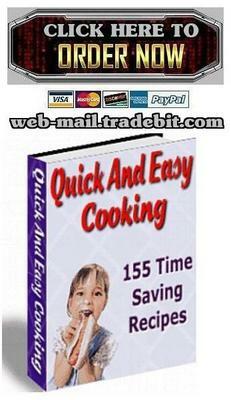 With Quick And Easy Cooking you can! 155 easy to prepare yet tasty recipes that you and the family will love. Quick And Easy Cooking is the perfect cookbook to help you prepare great meals without a huge amount of preparation time. Order today and start saving time in the kitchen immediately!